Henderson, an Opelousas native and second-round draft pick of the Saints in 2004, recently wrapped up his sixth NFL season helping his team to a 31-17 win in Super Bowl XLIV, a game in which he had seven receptions for 63 yards. Since then, Opelousas and the entire state of Louisiana, for that matter, hasn’t been the same. Henderson saw firsthand as he entered the store to a multitude of cheers. “It’s good to see how much the fans appreciate me, the team and what we’ve done,” Henderson said. Posted in Pictures | Comments Off on Kids Whodatnation Shirts ! Once upon a time, quarterbacks couldn’t blink against an NFC South defense. Next season, they might be able to take a nap out there. Almost nobody in the NFC South. When it comes to pass-rushers, they seem on the verge of extinction in the division. 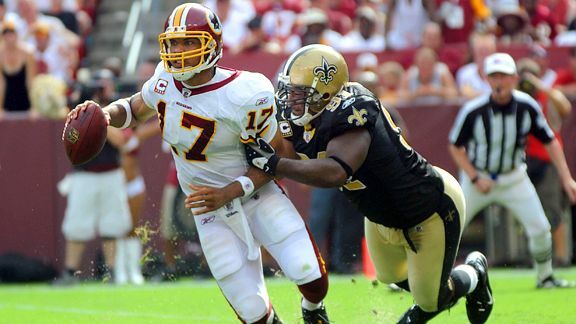 New Orleans' Will Smith is the last member of a dying breed of elite NFC South pass rushers. We’ll start by singling out New Orleans’ Will Smith. He’s the best pass-rusher and best defensive end in the NFC South. He’s probably the only guy who scares anybody these days and that’s more than a little ironic because Smith used to be the guy with the underachiever label. – He used some strong words to emphasize that the team is planning to keep tailback Reggie Bush in the fold, regardless of the fact that Bush is due a base salary of $8 million this year and $12 million next year. Some GREAT pictures.. click here to see them ! Another angle of the Porter interception in the Superbowl. I can watch this pick 6 from every angle!! Kyle Turley’s new rock and roll video. Kyle Turley has a new career. I have to say I am impressed. Not only that his soul bleeds Black and Goldm, but he is not that bad of a musician. Kyle Turley is a part of the Who Dat Nation! Posted in Videos! | Comments Off on Kyle Turley’s new rock and roll video. 1. First, I have to ask, how would you describe the atmosphere in the Superdome after you won the NFC Championship? Electric!! As soon as the kick got over the line of scrimmage the fans in the end zone started to celebrate, so at that point I knew it had to be on track to be good. After that it was a man hug session (haha). We all were so excited! Everything that we said we wanted to accomplish had been done. We still had one goal left, but to get to that point was a great feeling for us also. Four years ago we got to that point and came up short and that was one of the worst feelings you can ever experience as a professional athlete. Reggie Bush meets Ladainian Tomlinson. Historic video of Reggie as a high school student meeting LT. Something for all the Bush-LT-Brees conspiracies. Posted in Videos! | Comments Off on Reggie Bush meets Ladainian Tomlinson.